It seems there is a chance, if a small one, that we could still see Deontay Wilder defend his WBC heavyweight crown against Cuban Luis Ortiz. As fans know full well, Ortiz tested positive for a banned substance shortly before his scheduled November 4 challenge of Wilder, the fight being scrapped – much to the annoyance of Wilder, who saw yet another big fight/payday crumble due to no fault of his own. But the WBC ruling – which states how the sanctioning body will not ban Ortiz, that the Cuban’s explanation that he took medication for high blood pressure and nothing more has been accepted – allows Ortiz to fight for the title in the near future. Naturally, Ortiz is very happy with the ruling; even if he has been ordered to pay a (relatively small) fine of $25,000 for failing to inform the WBC that he was taking medication for is high blood pressure. Wilder, so angered at the November fight falling apart (just like his big 2016 fight with Alexander Povetkin) has stated an interest in still fighting the southpaw – to “make him pay,” as the unbeaten KO-King put it. So, has Ortiz got off light, or was he guilty of nothing more than taking medication for high blood pressure as he and the WBC ruling insists? Fans will likely have their own opinion on the matter. 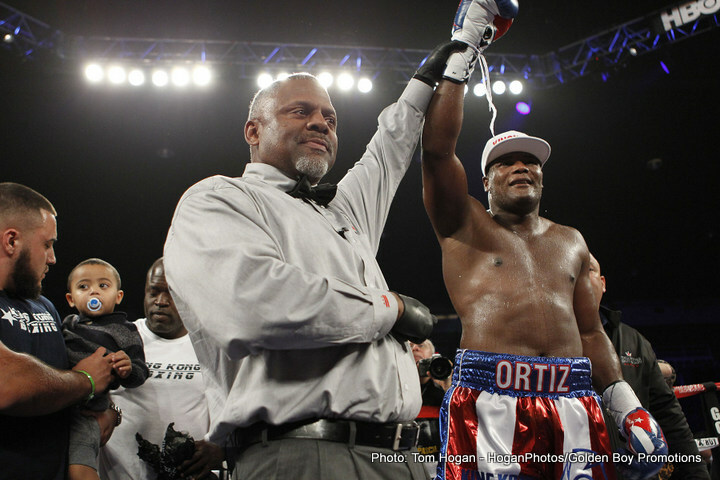 But whatever fan opinion says, Ortiz is back and ready to again call for the big fights. Would you still have an interest in seeing Wilder-Ortiz?